As the only member of the Association of Wedding Gown Specialists™ in south central Pennsylvania, we take great pride in offering an extensive list of wedding gown-related services, all of which are performed on-site by our Certified Wedding Gown Specialist™ and professional wedding gown tailors. Not every dry cleaner is considered a specialist in caring for wedding gowns. Trusting a member of the Association of Wedding Gown Specialists™ is the most responsible way to have your gown cared for before and after your wedding. The Association of Wedding Gown Specialists™ is endorsed by many famous designers, as well as the Association of Bridal Consultants. In our wedding gown cleaning and preservation process, we pay the utmost attention to detail. 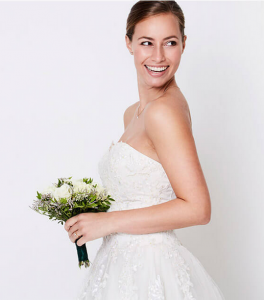 When cleaning your wedding dress, we remove any soiling from dirt, food and makeup. After the wedding dress is clean, it is ready to be preserved. As a member of the Association of Wedding Gown Specialists™, we offer a Lifetime Guarantee with all wedding gown preservations. We also exclusively offer ZeroCarbon™ cleanings and preservations. The carbon footprint created by the cleaning and preservation process is covered by our donation back to Carbonfund.org. We have several professional tailors who specialize in wedding gown alterations, as well as bridesmaid alterations and other formal wear. Our tailors can perform even the most difficult wedding dress repairs, such as: shortening a wedding gown without affecting a decorative hemline; creating a beautiful bustle on the wedding dress that is unique to the bride, and tailoring the wedding dress seams for a perfect fit. Do you love the idea of wearing a family wedding gown, but hate the idea of sacrificing your personal style to do so? Our tailors can create amazing modern-day gowns from vintage wedding gowns, or incorporate fabric and details from a family wedding dress to add to a new wedding gown. Would you love to wear a family wedding gown or heirloom piece, but it’s in desperate need of care? Perhaps you want to restore and preserve a family gown to be enjoyed by future generations? Our Certified Wedding Gown Specialist™ has extensive experience with vintage wedding gown restoration. Let our Specialist restore the original beauty of your vintage family heirloom and turn it into the piece of your dreams. In many cases, our Specialist™ can restore pieces to their original color. Take into consideration that your daughter may want to restore your dress when she gets married. 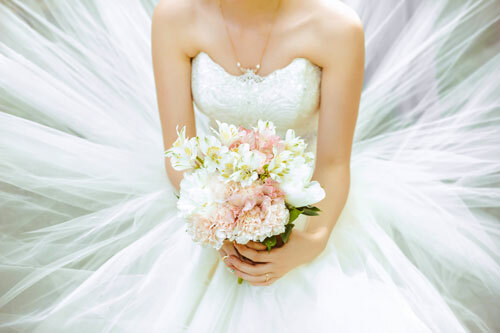 Be sure to have your wedding dress professionally cleaned after the wedding. We can then make sure the wedding gown is properly preserved for future generations. A wedding gown is probably the most important (and expensive) gown you’ll ever own. Some women preserve their gown in hopes that it will be worn again, while others intend to use the fabric for christening gowns and keepsake pillows. Proper preservation for long-term storage is key to making sure your gown can be enjoyed by future generations. After cleaning, your gown is carefully packaged in a museum-quality, acid-free wedding dress preservation chest (or wedding dress storage box). The chest protects your gown from air and light, both of which can damage fabric, during wedding dress storage. Vinyl wedding dress garment bags and wedding gown storage bags are great for short-term usage and travel, but should never be used for long-term storage. How is your preservation process different? We clean gowns according to museum-quality practices. We take extra steps to be certain all stains, both seen and unseen, are removed. Spills such as champagne can dry without leaving a mark. If left untreated, stains can permanently damage fabric. What is the guarantee you offer? Our written international wedding gown preservation guarantee is backed by the Association of Wedding Gown Specialists, represented in more than 500 cities around the world. Return your gown to any participating Certified Wedding Gown Specialist™ who will inspect and press your gown at no charge. What if I open the chest? Opening your preservation chest does not void our guarantee, or “break a seal”. However, improper handling or wearing of your gown may cause damage. We recommend consulting a Specialist should the chest need to be opened. If you are outside the Greater Harrisburg area, we offer Courier Service.